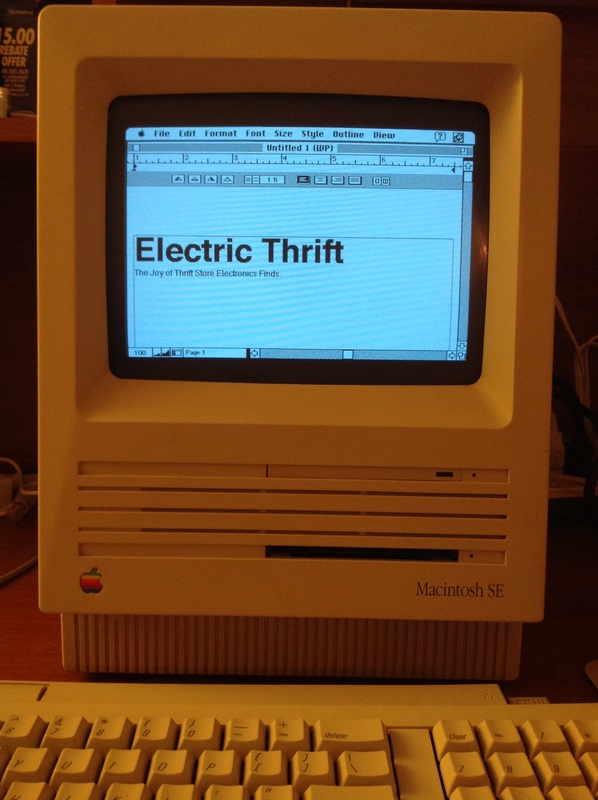 This is my Macintosh SE, that I purchased sometime before mid-2003 at the old State Road Shopping Center Goodwill. If we believe this Apple serial number decoder my Macintosh SE (serial # F9063FVM5011) was built in the 6th week of 1989 in Fremont, California. This Macintosh SE still works, outside of the fact that I’ve never seen the hard disk activity light blink. It runs System 7.0 and seems to have been upgraded from the stock 1MB RAM to 4MB. 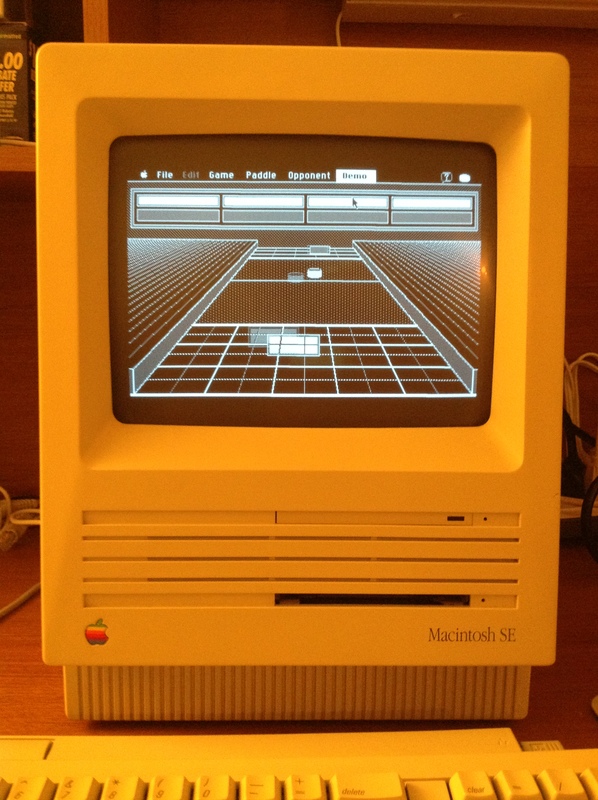 At the moment this is my oldest working Macintosh. In my post about the original Macintosh I said that machine held a lot of promise but was incomplete. The Macintosh Plus vastly improved the situation in 1986 by adding 1MB of RAM standard and a SCSI port for adding a hard drive. But considering how many pictures you see of Mac Pluses sitting atop an external hard drive you can’t really call that machine totally complete either. The Macintosh concept really lent itself to having an internal hard drive. 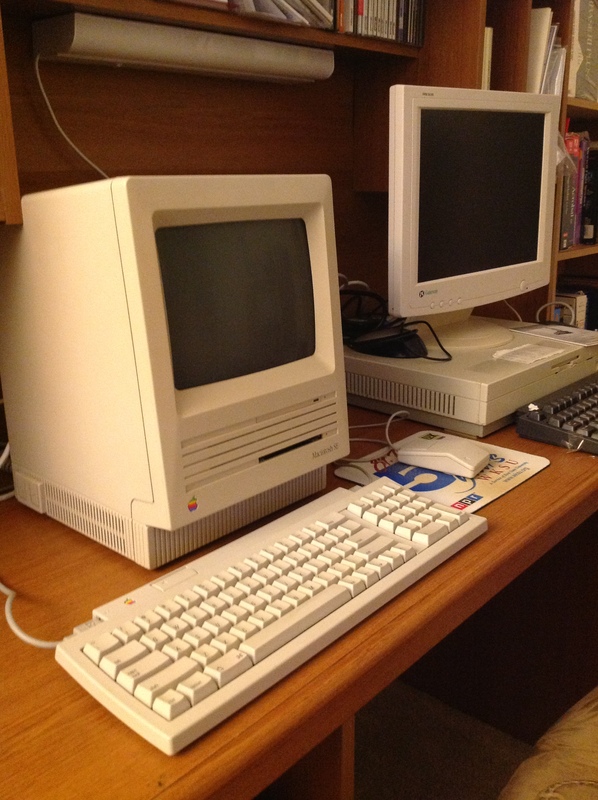 It wasn’t until 1987 when the Macintosh SE was released with an option for a built-in hard drive and the Apple Desktop Bus for peripheral accessories that you could really say for the first time the original vision of the compact Macintosh was complete. In addition there was an expansion slot crammed in the back of the machine (behind Torx screws), which is where Apple got the “System Expansion” moniker from. 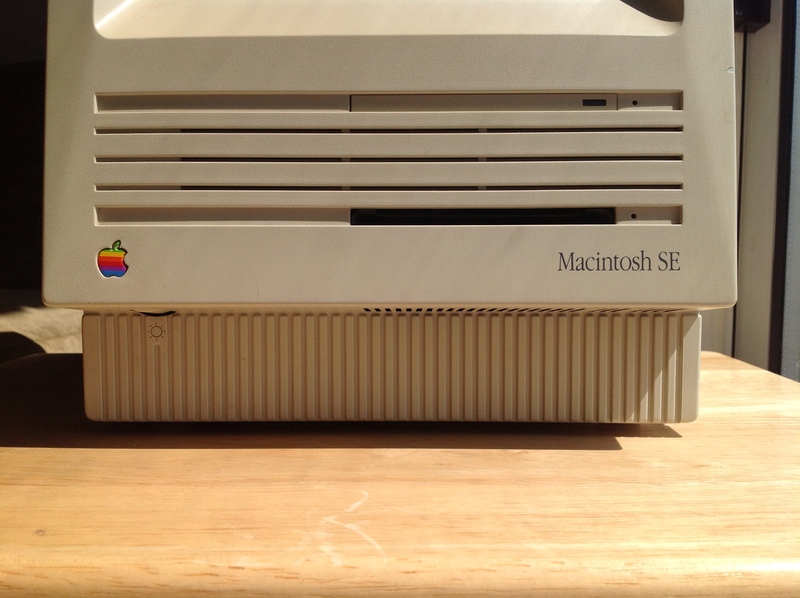 The SE was based on the same Motorola MC68000 CPU running at 7.83Mhz as all previous compact Macintosh models but added a fan that probably led to increased reliability due to better cooling. It’s notable then that at the same time the Macintosh SE was released in March 1987 the Macintosh II was also released, which totally changed the conception of what the Macintosh was. Some time in 1989 my mother visited a computer store in west Akron and picked up some Apple brochures that sat preserved in a drawer for years until I found them. 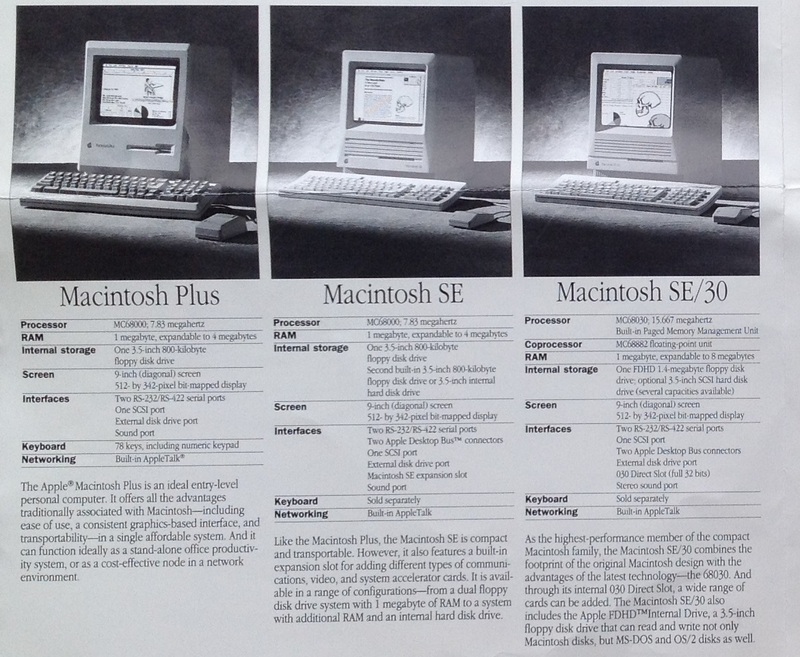 From one of those brochures, here is the state of the Macintosh lineup in early 1989. The Macintosh II was basically the Macintosh re-imagined as an open, expandable desktop personal computer in the vein of the IBM PC AT and was based on the more powerful Motorola MC68020 CPU. 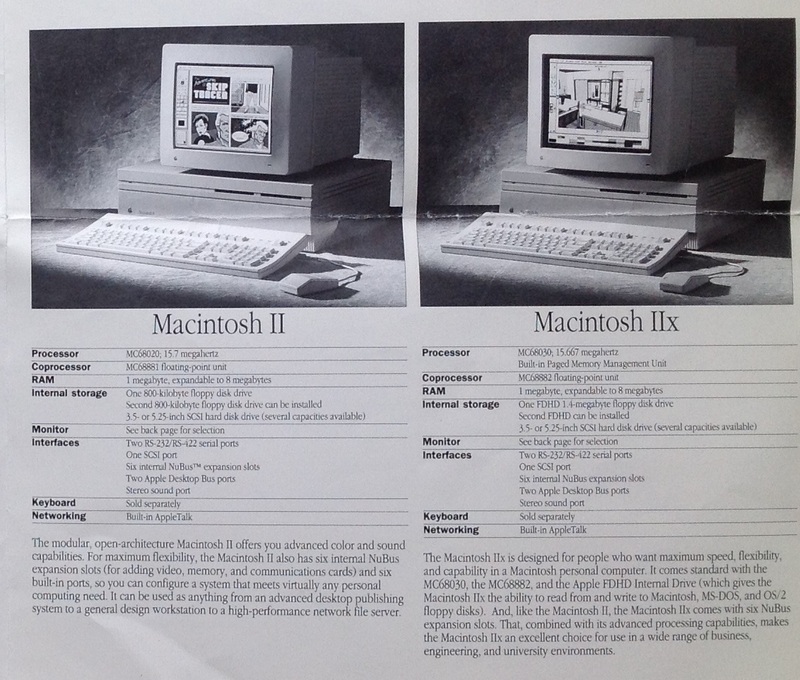 The Macintosh II implicitly admitted the Mac platform was too expensive to be the “computer for everyone” and finally dispensed with the appliance pretenses of the compact Macs. Instead, Apple positioned the Macintosh II as a business workstation priced at a cool $5500 (before you bought a video card and monitor…Ouch). 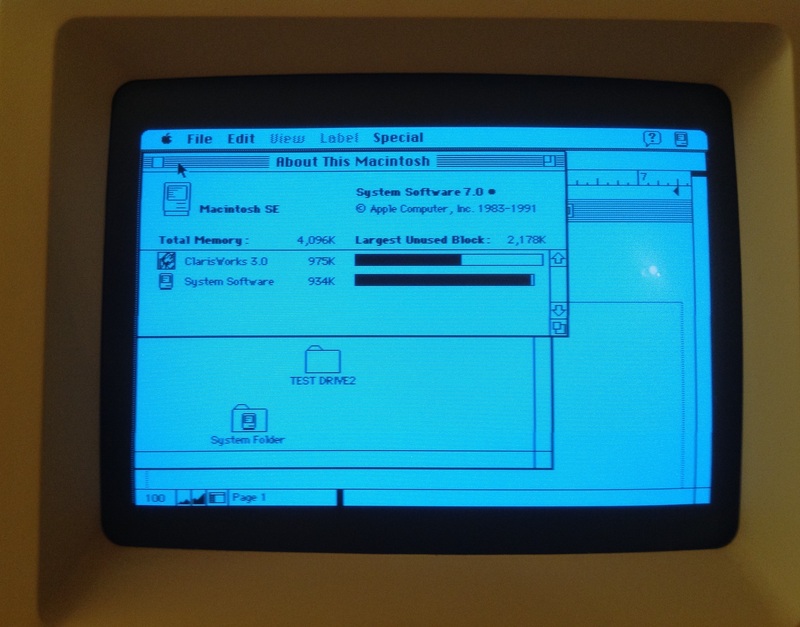 People were doing desktop publishing and graphics design on Macintoshes before the Macintosh II but I suspect that once you used a 13in 640×480 screen and enjoyed the benefits of what was then a fantastical amount of RAM and the 68020 CPU you were loathed to go back to a 68000-based compact Macintosh like my SE. 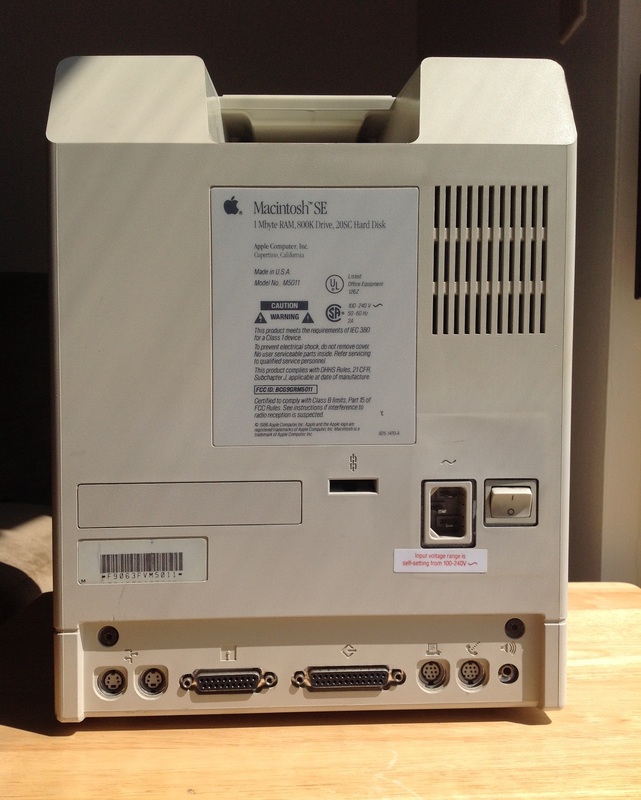 So there’s a certain disappointment to the historical fact that by the time Apple built a compact Macintosh that really paid off the original concept the future was pointing to expandable Macintoshes that resembled desktop PCs. With that said, if you had purchased this machine at the time, I suspect that you were very happy with it. When you sit down with one of these machines at a desk you quickly understand how the subtle angle of the front of the machine puts the screen right in line with where you eyes want to look. The lovely glow the 9″ black and white CRT focuses your attention despite it’s small size. I think this would have been an enjoyable machine to own in 1987-1989, even considering that the price tag at the time for the model that included this 20MB hard drive would have been somewhere substantially north of $3000. Plus, you could play Shufflepuck. 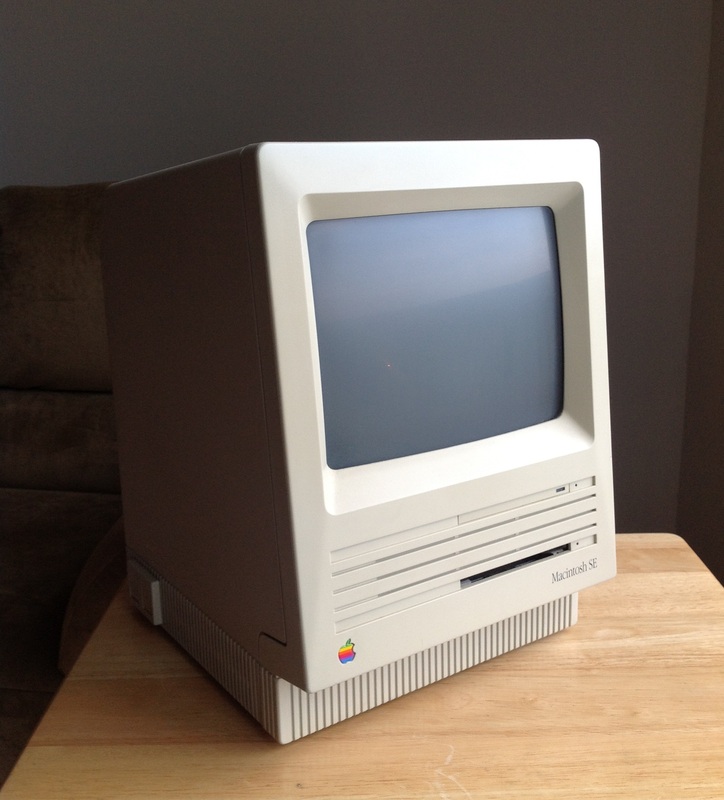 The Macintosh SE is also the best example I own of Apple’s Snow White design language, which saw it’s heyday in the Macintosh line from 1987 to 1990. Previously I’ve talked about how I love the angular, metallic look of many pieces of 80s electronics. Snow White goes in the opposite direction by emphasizing ornamentation and subtle curves in injection molded off-white plastic. The overall effect is stunning. It’s somehow very 1980s but at the same time stands out among other designs. You can learn more about the different components of Snow White from Ed Tracy’s excellent 1998 graduate school project about Apple’s industrial design. You may have also seen these wild prototypes that came out of the studies that designer Hartmut Esslinger from Frog Design created for Apple while developing the Snow White look. One of the first Snow White products was the memorable Apple IIc, which may be my favorite looking computer, period. The idea behind Snow White was to take full advantage of the fact that Apple used injection-molded plastic cases rather than the sheet metal other computers used. If computers need air vents for cooling anyways, why not adorn plastic computer cases with horizontal and vertical lines that look like vents so they distract your attention from where the real vents are? 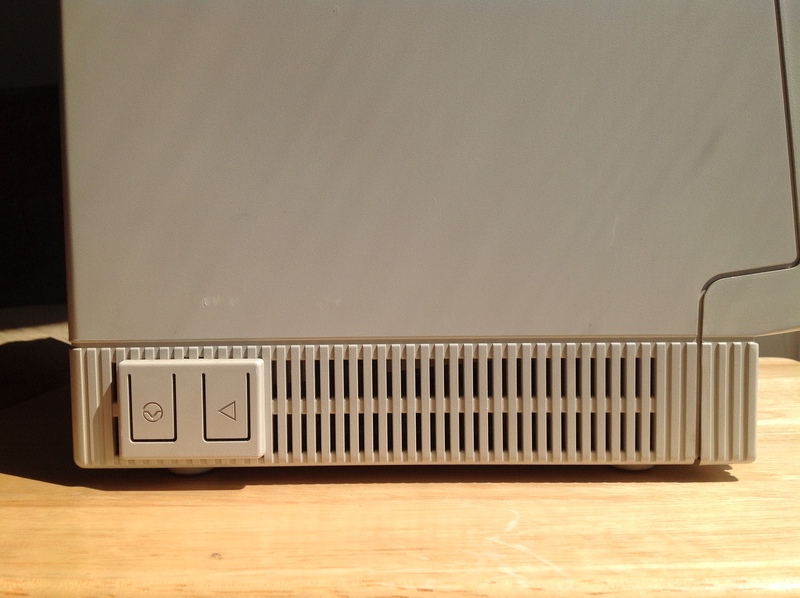 On the front of the Macintosh SE this results in a “grill” that contains the floppy drive, the hard drive indicator light and an air vent. 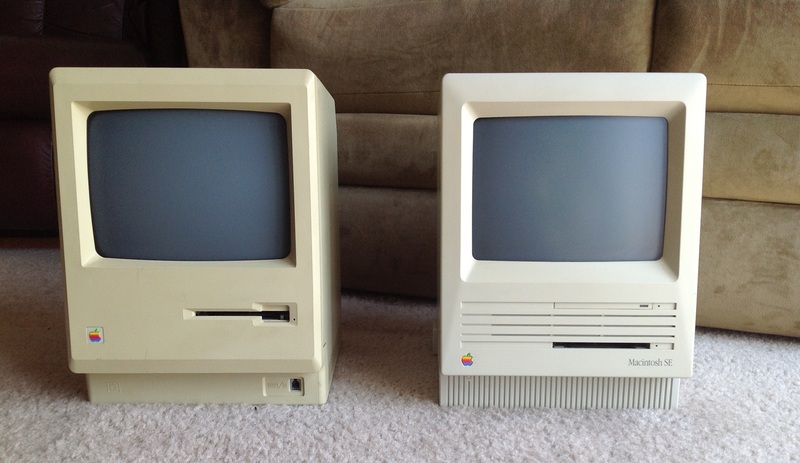 Adding the grill drastically changes the appearance of the front of the machine as compared to the original Macintosh case, even though both machines have basically the same dimensions. The front of the original Macintosh is dominated by the large bevels that surround the floppy disk drive where on the SE the floppy disk is de-emphasized as a thin line that matches the rest of the grill. My favorite Snow White design element is the pedestal of vertical lines along the base of the Macintosh SE and the Macintosh II series cases. 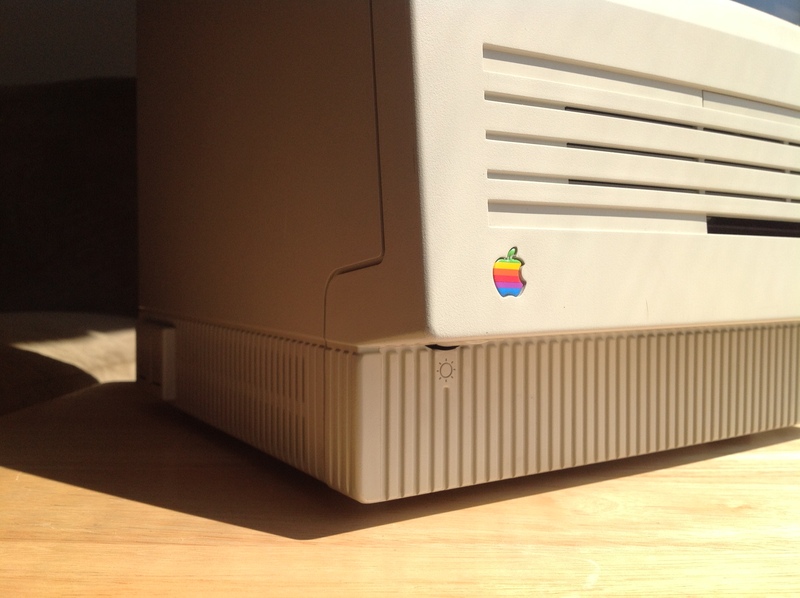 The lines on the pedestal help to conceal the air vents on the side of the machine that had been much more apparent on the previous compact Macintosh cases. Sadly, the pedestal feature is often hidden behind the keyboard sitting in front of the computer. Apple also produced monitors, CD drives, external hard drives, printers, scanners, and other accessories with Snow White designs from about 1986-1990. A fellow could fall down a deep rabbit hole collecting all of them. I’m somewhat enamored with the various Snow White computers and accessories. In my opinion the Snow White designs have so much more personality than practically every other personal computer ever made, including Apple’s current product line. Plastic might be out of vogue today, but Snow White showed us that plastic can be just as profound as brushed metal. 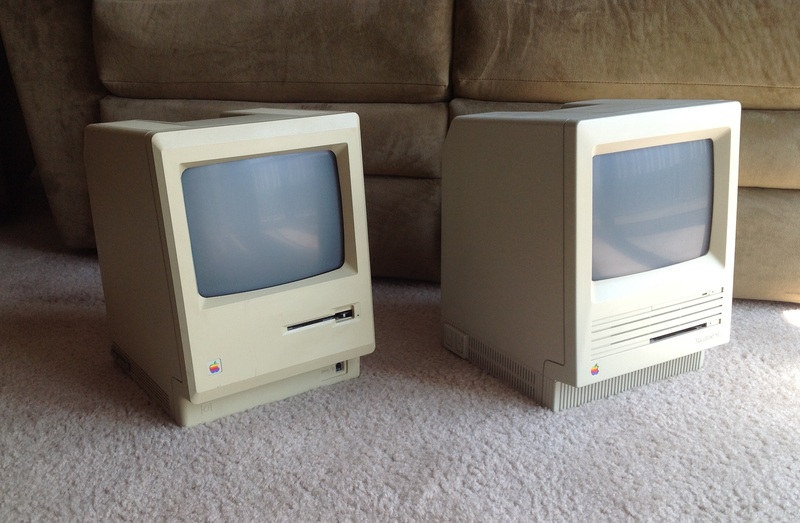 Before I really dug into learning about the Snow White look, I thought the Macintosh SE looked a bit funky. The loss of the beveled edges the original Macintosh introduced gives the Macintosh SE a fat “chin” below the floppy drive. If you sit a big keyboard in front of it so that the main Snow White feature you’re looking at is the grill below the screen, the machine loses at lot of it’s appeal. 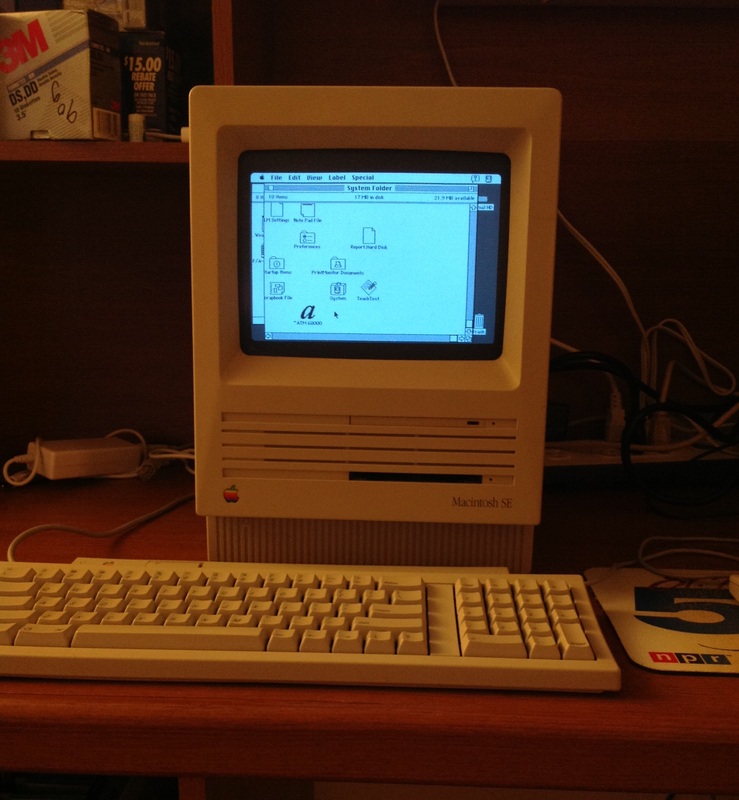 However, as I have read more about Snow White I have come to appreciate the appearance of the Macintosh SE.